I was recently having coffee with a very smart man by the name of James Wilson. Our conversations often revolve around finding practical solutions to reducing climate change and minimizing waste. This day was no different. 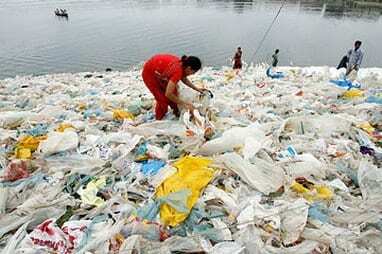 We began to discuss the topic of plastic bags, and in particular, our own hypocritical actions regarding their use. We, like many shoppers, use plastic bags. And we, like most who pause for thought, don’t like the waste they produce. And like most, we know we should use reusable cloth bags. But the truth is we have not formed a good habit and simply forget. A supermarket owner who wants to do the right thing is caught in a dilemma. Shoppers expect plastic bags. If the supermarket stops providing them, then the owner fears customers will see them as a cheap or inconvenient store, and go elsewhere. James came up with a really simple solution… have a bag exchange system. The idea would be for the supermarket to provide reusable bags. Each time you need one you leave a deposit for each bag you take, and use as many as required for that particular shopping trip. The next time you return, and like us, you forget your bags, simply put another deposit down and take more. After a while, you end up with a pile of these bags overflowing from your draw. Only this time it is a draw full of reusable bags, not plastic ones. So you empty your draw and take the bags back to the supermarket to refund your deposit. This way you never need worry about forgetting a bag, or having enough. You can do your shopping a little more guilt free, and no longer be faced with the moral dilemma of having to throw away a heap of plastic bags as you can no longer fit them in your bag storage space. For the business, it can be a great marketing angle. People love the opportunity to do the right thing, especially when it is without compromise. It also avoids the need for buying endless plastic bags. Even better it encourages customers to come back. The business may still choose to have plastic bags as an option, perhaps for customers just passing through town. But overall this simple idea could reduce a huge amount of waste, and all the embodied energy this waste contains. If you are a business that can use this concept then give it a try and let me know how it worked out for you. There is, of course, a great potential business in this idea for some savvy socialpreneur to create these bags, then market the concept (and their bags) to supermarkets. Given the number of supermarkets globally, this could be quite a lucrative business. I am sure there must be some stores out there already using this idea, so if you know of any please do let me know. But for the purpose of this post, kudos to James for such a simple solution to a very big problem. In some research paper bags are actually worse than plastic (from a climate change perspective). Paper is not as environmentally friendly as you may think. It still requires processing and transportation, and a paper bag requires around six times the amount of raw material to make compared to plastic. (It is not as strong, so it needs to be thicker). The real issue with paper bags though is when they end up on landfill instead of recycling, which sadly remains the reality for the majority of them. When they decompose in this environment they give off methane, which is around 26x worse as a greenhouse gas than carbon dioxide.